Placing an ad in the classified section of the newspaper can be a good old-fashioned way to find tenants for your rental property. It's worked for decades for a reason. Prospective tenants typically look there when they're searching for homes, even if they don't only look there. It's not a complicated process, but forewarned is forearmed so consider these issues first. Running a rental ad isn't free. Newspapers typically charge by the line, but some might charge by the number of characters. Some charge by the day while others will offer discounts if you run your ad for an entire weekend or in consecutive weeks. Factor in the cost of running a newspaper ad compared to the potential benefit of being able to find quality tenants...and to find them quickly. Should You Run an Online Ad as Well? Many newspapers offer online classified ads as well. These ads are usually cheaper than placing an ad in the actual print paper, and you'll typically have more allowable characters. Sometimes you can even include a picture. And you'll most likely target a much larger audience. Studies indicate that more than 76 percent of American households had internet access in 2016, the most recent year for which comprehensive statistics are available. About 68 percent also surfed the web on their smartphones. That's a lot of prospective tenants who might not pick up a paper newspaper. On average, online ads run for 30 days for a set fee. Keep in mind this won't reach those who don't look at the online versions of newspapers, but as the numbers indicate, these households are rather few. And some newspapers offer combination deals, so you can run a print ad and an online ad as well for one price. You'll be limited in the amount of space you have to make an impact, but you'll want to be sure to include the most important features of your property so your property stands out from the others listed. What does your unit offer that most others don't? Will you allow pets when most landlords shudder at the thought? Get this in there right behind the dwelling's specifics, such as number of bedrooms and baths. Find out if the newspaper will allow you to capitalize certain words so they grab a reader's attention. Abbreviations can be your best friend. For example, you can say "H/HW" to save space instead of writing out "heat and hot water." You generally won't be able to include pictures, however, and even if you could, the images would be so small that including one or more would be a waste of your money. Do your research so you can be sure that your ad will reach the largest audience possible. Make a list of the newspapers that are in circulation in your target community. Try to find out their average readership. Choose the one with the largest following to get the most bang for your buck. And make sure to match the paper's following to your target community. The LA Times might have the largest readership in the greater Los Angeles area, but there might be another paper that people in your community would be more likely to read if your property is in Burbank. Advertising in a local paper can be more advantageous. 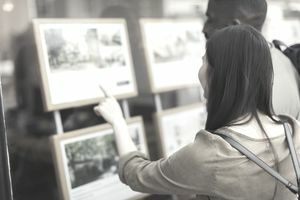 You can set yourself up to know what ads and which newspapers produce the best results if you're in the business of renting homes or apartments—this isn't a one-shot challenge. Consider tagging your ad with a "key" that will tell you were the prospective tenant saw it, such as by offering some small, extra perk if she mentions the name of the newspaper. When Will You Run the Ad? You can run the ad for one day, for the whole weekend, only on Sundays, for a whole week, or even for a whole month. Keep in mind, however, that the more days you run the ad, the more expensive it will be. Many people get only the Sunday paper, so you might want to try only running the ad this one day at first to see what type of response you get. You can branch out later if necessary. Wednesdays tend to offer a lot of food and grocery advertisements and show a corresponding increase in readership, so you might want to run your ad on this day, too. Most newspapers give you the option of placing the ad online, but others will make you phone it in. Just type up your ad, check it twice, then follow the on-screen instructions for payment if you're able to place your ad using an online system. Otherwise, you'll have to dictate your ad over the phone and provide payment information if you must call the newspaper directly. Of course, if you live relatively nearby, you can still type up the ad, print it out, and take it to the newspaper office so you don't have to face the fraud risk of reading your credit card number into the phone.